Oops! Picked up a scratch, scuff, or dent lately? Click the video to see how repairs are carried out or click below to request a free quote. Smart Auto Fix™ use the most advanced colour analysis technology and the highest quality products, which are universally recognised as the best in the industry. Smart Auto Fix™ is the independent mobile paint service that gives you the most advanced colour analysis technology to achieve a perfect lifetime guaranteed colour match. Using state of the art methods to analyse paint colour, a highly accurate match can be made to make the highest quality of body repairs, ensuring that all products and techniques are guaranteed to produce invisible paint repairs in the shortest possible time. Why Smart Auto fix Ltd? Andy Withers operates his Smart Auto Fix Repair Service within Stoke-on-Trent and surrounding areas. See below for before and after images of a Smart Repair conducted in Stoke-on-Trent. Click and drag the slider to show the whole image. Andy offers a fully mobile repair service to your home or place of work from a fully equipped Mobile Mercedes Workshop, attending to a wide range of bodywork damage including; dents, scuffs, scratches, dings, cracks, splits, chips and on all areas of vehicle bodywork including wings, doors, wing mirrors, bumpers, boots, grilles, spoilers, valances, sills and body kits. A Smart Auto Fix technician uses the world’s most technologically-advanced colour matching system which ensures a perfect paint match on all painted surfaces across a wide selection of vehicles including; cars, motorcycles, vans, buses, coaches & trucks etc. There will be no more expensive trips to the body shop and your car won’t be off the road for several days. 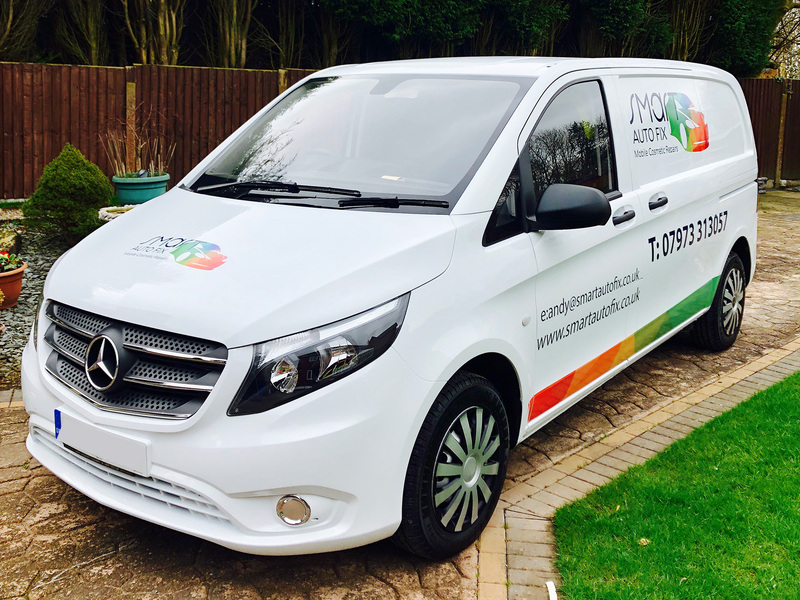 I work with private, trade and corporate clients and can offer a repair solution to suit your requirements, ranging from paint rectification work through to colour coding and paint code retrieval at affordable prices. All repairs are covered by a lifetime guarantee and cost savings are typically up to 50% compared to a body shop. All degrees of repair work are considered. Call TODAY on 07973 313 057 or fill out the Online Quote Form on the Contact page for a FREE No Obligation Repair Estimate. I contacted Andy after finding his services through Google to do some repair work on my A3. Andy was courteous and punctual, answered all questions I had and was social but not pressuring. The repair took roughly 90 minutes if I recall correctly and looked good as new. All in all very impressed with services provided and I would use again if any repairs were needed in the future. I would feel more than confident recommending him and his business to anyone that requires a repair. Andy worked on one of our fleet vehicles prior to it being returned to the lease company. The service was much more convenient than taking it to a garage and was completed to an exceptionally high standard. He’s also a nice guy which is important when he is on site completing work. I have used Smart Auto Fix on two occasions in the last year. Firstly, I had a big dent in the front wing of my Mercedes which another company had looked at and said they couldn’t do as it was too big, Andy looked at it, did it, and I was amazed; you could not tell there had been any damage at all. The second time I used the service was in April, I had the plastic Bull Bar taken off my Suzuki and it had left some deep chaffing marks across the front grill, headlight surrounds and front wings, plus there were other marks on the bodywork which needed attention. When Andy had finished it I couldn’t believe it, it looked like a new car. I would and do recommend this service to everybody I can because you can always rely on a first class job at a competitive price. I have had my car done twice by Andy. The work was excellent on both occasions. I would recommend Andy’s work every time and would not hesitate to use him again. We had a knock on the car which was dented and scratched, we had 4 estimates ranging from £220 to £375. We had a Smart Repair estimate of £160 plus VAT which we thought was very reasonable. Had damage to front and rear of my Silver Mazda 5, I picked up one of Andy’s flyers at Morrisons, Newcastle and rang his number. My call was returned the next day and an agreed date for inspection arranged. A price was agreed, which was very competitive and fair, and a date fixed for the repairs. Work was carried out to a high standard at my home and with very minimal inconvenience. All that was required was a nearby electric socket. recommend him – great professional job done.